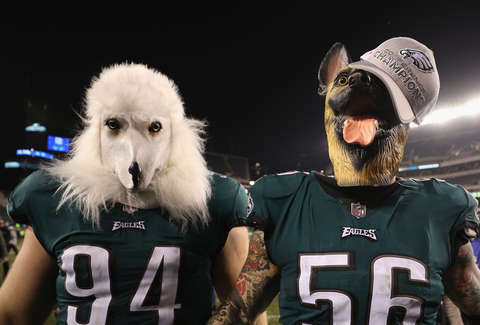 Why Are Philadelphia Eagles Fans Wearing Dog Masks? With an embarrassing blowout of the Minnesota Vikings, the Philadelphia Eagles have punched a ticket to the Super Bowl in Minneapolis with a chance to win the franchise's first-ever title. Why Are Eagles Fans Wearing Dog Masks? The masks started after the Eagles became the first team to ever be a No. 1 seed and a betting underdog in the team's first postseason contest. The Falcons were favored over the Eagles in that game, and the Vikings were favored over the Eagles in the NFC Championship. The betting line and feeling that a No. 1 seed might lose was partly because starting quarterback Carson Wentz tore his ACL 13 games into the season. He's one of many on the team that has suffered a significant injury. It has made people question whether the Eagles would be able to keep winning under the leadership of backup QB Nick Foles. So, the team and fanbase have embraced the underdog role by donning dog masks. It hasn't just been fans, either. Players are in on it too. Beau Allen and Chris Long grabbed masks from fans and threw them on after the Eagles were declared NFC champions. In the prior game against Atlanta, Long and Lane Johnson did the same thing. To boot, Long, who is donating his entire salary to charity this season, called out the NFL's attempt to capitalize on the craze. The NFL started selling underdog t-shirts, and Long said they should donate all the money to charity. 24 hours later, Long announced that's exactly what the NFL is doing with 100% of the proceeds from their underdog t-shirts. Where Can You Buy a Dog Mask? If you've got a dog mask, there's no need to throw it out. The Eagles are the underdog in the Super Bowl as well. However, if you want a mask of your own, you ought to get on it. Shops across Philadelphia are struggling to keep masks in stock and, as you can see above, they're selling out on Amazon and at Walmart. That's led some suppliers to scramble and it's forced an increase in prices, according to ESPN. CreepyParty, the company that made the German shepherd mask worn by Long, sold out of their stock and even has a note on their site about their supply issues. The company expects to have more available for order starting on January 25. It is also guaranteeing that you'll get your mask before the Super Bowl. Though that German shepherd has been sold out, you can still find a lot of masks on Amazon that are in stock. (And here's that poodle from the image above.) There are also places that aren't Amazon, like Archie McPhee that carry latex dog masks. However, shipping and other details vary from site to site, so make sure you know you're getting it in time to bark madly at the TV. The Eagles an underdog in Super Bowl LLII. So, Philly fans in Minneapolis can proudly don their pooch faces. Fortunately, for fans of the underdogs, the NFL has announced that you are allowed to bring masks into the game. Your plans to frighten children on the concourse are a go! The tight security at the Super Bowl will not confiscate your second face at the door. The only requirement is that you take the mask off while going through stadium security. But you probably guessed you weren't going to be allowed to wear a mask worthy of The Purge through security. Dustin Nelson is a News Writer with Thrillist. He doesn't mind the Patriots because every story needs a villain. Follow him @dlukenelson.